In collaboration with our partner Lloyd’s Register, we’re hosting a BIM Accreditation Masterclass at The National Motorcycle Museum in Birmingham. It aims to provide you with a thorough explanation of the BIM accreditation process, the new ISO19650, explain how you can achieve it, and explore the role that document management has to play in the process. A free tour of The National Motorcycle Museum is also included. Numbers will be limited, so we encourage you to register early. 10:30 – Document Management – can it contribute to the accreditation process? Now business development manager for Lloyd’ Register UK, Terry comes from a background of chartered engineering. He has over 30 years’ experience of service delivery to the conventional power generation, nuclear and utilities sectors, with a flair for innovation and solution resolution through the development and management of new and sustained services to sectors as diverse as electricity, water, telecoms, gas and nuclear sectors, and as generic as supply chain and construction. As external influences continue to drive the profession to evolve, it has never been more important to come together at this annual event and discuss new approaches to meet changes in client demand and face upcoming challenges. Attending Building Surveying Conference 2019 will give you the opportunity to benefit from the knowledge of our high-level speakers, ensuring you remain at the forefront of your profession and are equipped to provide the best advice to your clients in common areas of practice. As well as the usual breakout sessions offering up-to-date technical information and the latest guidance on key topics, this year’s plenary sessions will examine the renewed focus on fire safety issues. Recent major fire incidences have resulted in renewed focus on the fire safety agenda and potentially widespread changes in the way buildings are designed, built and operated. During this session Gary Strong, Global Building Standards Director at RICS will address the most recent developments following The Independent Review of Building Regulations and Fire Safety and will provide an update on the development of International Fire Safety Standards. Hear from Niall Rowan, Chief Executive Officer at Association for Specialist Fire Protection as he addresses best practice in Passive Fire Protection, fire rated foams – myth and reality and the latest trends in the industry. We close the day with our annual economic forecast and finally our inspirational closing keynote, which this year is delivered by Mandy Hickson, former Royal Air Force fast jet pilot and one of the first female pilots on her frontline Tornado GR4 squadron. This webinar provides an overview of the Design Productivity Review (DPR) service. Technology in the construction industry is ever evolving, which can make it difficult to keep up with better, more efficient methods of working while under pressure to complete projects. It can be quite time consuming to stand back, review, learn and implement new practices. With demanding workloads, we’re more likely to stick with what we know. Therefore, it may be more appealing to look to the expertise of an external team to provide focus and help align to your future needs, specifically within this area. Introducing the "Design Productivity Review"
15may12:00 pm1:00 pmIntroducing the "Design Productivity Review"
Technology in the construction industry is ever changing, and it’s sometimes difficult to keep up with better, more efficient methods of working. It can be quite time consuming to stand back, review, learn and implement new practices, and with demanding workloads, we often stick with what we know. The popular RICS Fire Safety Conference is coming to the North of England and will be held at The Principal, Manchester on 21 May. Our expert speakers, including Dame Judith Hackitt DBE, will address the key fire safety considerations, building regulations, identify best practice, and provide expert knowledge to best advise your clients. The Independent Review on Building Regulations and Fire Safety – Hear from Dame Judith Hackitt DBE on the Final Report of The Independent Review on Building Regulations and Fire Safety. The Golden Thread – Accountability throughout the building lifecycle – Chaired by Martin Conlon (Chair, RICS Building Control Professional Group), a panel of experts will explore the different types and stages of fire management and effective integration of fire safety technology. Fire-related building defects – Understand façade cladding defects and failures, including an examination of different cladding materials, penetration through walls, cavity barriers and compartmentation. Remediation – Not as straight forward as it seems – A series of relevant case studies will examine who is responsible for remediation works, discuss worst case scenarios, as well as top tips to avoiding exposure and limiting liability for duty holders. International Fire Safety Standards – Gary Strong (RICS) will deliver an update on how this standard will bring greater consistency by setting minimum levels of fire safety and professionalism across the world. Variously described as “the greatest technological leap since the invention of the internet” and “a mix of hype and hot air”, there’s no denying that blockchain is animating tech enthusiasts. Join the upcoming RICS Digital Built Environment Conference and attend a blockchain masterclass to look at various applications of the technology in the professions of the built and natural environment. How might it change the way that real estate is transacted? What are the benefits of a blockchained supply chain? Could it drive improved resource usage and eliminate materials waste? Attend the conference to find out. Book before 23 April to get 10% off with the Early Bird discount. Hear expert insights into how digital twins are being utilised in practice to enhance the relationship between owner and tenant within the commercial real estate sector, and improve decision making processes through analytics. Learn how geolocation can help you make better decisions about real estate assets and analyse prospective project sites. How are complex planning and development decision simplified by the technology and what will be the knock on benefits for citizens? This webinar briefly outlines Excitech’s approach to organisational development, particularly focusing on pre and post skills assessments with KnowledgeSmart. KnowledgeSmart delivers skills gap analysis and bench-marking services for architecture, engineering and construction organisations. Join us on the 13th June, where Excitech will team up with KnowledgeSmart to provide an overview of the platform and how it can fit into your organisational development plan. Develop employees’ skills on a continuous basis, tailored to their individual needs. To help your employee’s development journey further, KnowledgeSmart has recently integrated with the powerful e-learning platform, Pinnacles Series. This integration connects the skills gap analysis with a training plan, and readily available courses. Progress can be tracked and information can be revisited easily and quickly. Excitech and Eagle Point are pleased to announce a joint webinar that will take place on 11th July 2019, showcasing Pinnacle Series, and we’d love you to join us. Engineering and Construction industry. It offers a wide range of CPD-certified training courses, including personalised learning paths, and live chat support. Pinnacle Series now integrates with KnowledgeSmart, the skills gap analysis and benchmarking tool, providing an end-to-end learning solution. We’ll be providing an overview of the platform and will demonstrate how Pinnacle Series puts you in control of your employees’ skills development. With the Autodesk 2020 updates due out soon, it’s important to ensure that your hardware is fit to run the new releases of applications such as AutoCAD, Revit, Navisworks, Inventor etc. To help our customers ensure they have the right technology for their needs, we’re holding an informal meeting together with our partner Dell EMC to showcase some of the latest and most powerful workstations which best support and enhance the different workloads created by your design software. We’ll feature the Dell Vostro, Latitude, XPS, Optiplex Micro, Mobile and Precision workstations as well as Curve and Dual Monitors and Virtual Reality (VR) headsets. We will be running this event twice during the day so join us for either the morning session or afternoon session to learn, talk to the experts, and experience the technology. We recommend bringing along a USB stick with one of your models on, so that you can see the benefits for yourself. This webinar provides an overview of what Organisational Development is. We will explore some of the latest tools and techniques available to ensure your teams’ skills remain current and competitive. For architects, engineers and construction professionals, training is the backbone of an organisation’s continuous skills improvement; enriching team capabilities and improving client satisfaction. Training is not a one-time deal though; details get forgotten, Revit and other software gets upgraded, and the technology at the heart of many design and construction processes constantly evolves. Valuation 2019 comes back with a refreshed programme making this the go to event for valuers in the industry. Featuring five breakouts for each specialised area of the valuation profession, this event will tackle topics that are most relevant to you and your professional development. Join us as we start off the day with a series of plenary talks, including topics covering global market conditions and predictions and what it takes to value iconic properties. Stay up to date with the latest changes to the Red Book and join a panel discussion where we will be exploring the challenges and opportunities facing the valuation sector, addressing key issues such as the impact of disruptive technology, how best to attract the next generation and how the industry should respond to the uncertainty and unpredictability which exists in the profession. Don’t miss the opportunity to network with industry colleagues during refreshment breaks and at our post-event drinks reception. With a crucial update on alternative market sectors, case studies and worked examples on unusual valuation scenarios, as well as insight into the impact of minimum energy efficiency standards on pub lets, this session will equip you with the most up to date information and knowledge so that you can be in a better place to give professional advice to clients. What does it take to calculate the reinstatement cost assessment for plants and machinery? How do you carry out a valuation of a business that is about to cease trading and what are the valuation considerations of compulsory purchase? Attend this breakout to find out more and to hear the latest issues arising around insolvency and the impact on this specialist area of valuation. Art litigation, money laundering, lack of art provenance and managing public art – just some of the issues that an arts and antiques valuer can get involved in. Delve further into these topics as our speakers shed light on tips and tricks for avoiding disputes, ensuring the correct policies are set in place for high value dealers, the importance of art provenance and the growing value of public art. 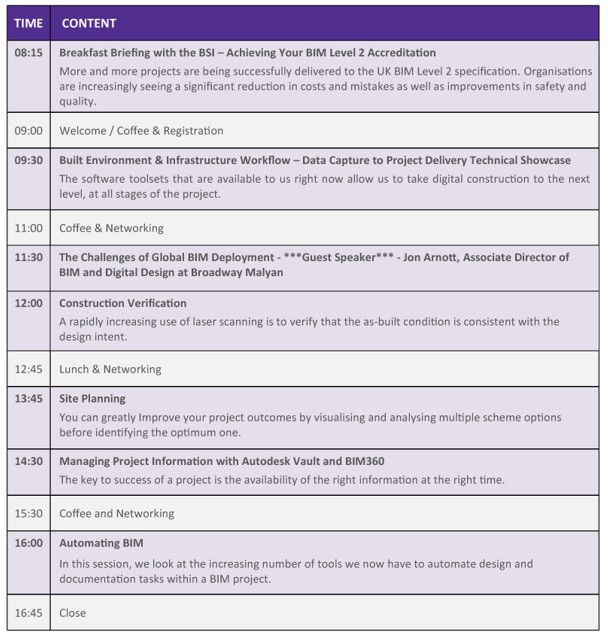 Join Excitech on Thursday 21st March 2019 in Birmingham as we walk through how BIM 360 is solving a range of industry challenges and how Bailey Partnership is leveraging BIM 360 to its advantage. There will be live demonstrations supported with insights from guest speaker, Mike Smith RIBA DipArch BA (Hons), Senior Associate and Practice BIM Manager at Bailey Partnership, on his experience with BIM 360. There will also be several opportunities to network and discuss your new learnings with like-minded individuals from the industry. We’ll run through how BIM 360 Docs helps to solve challenges of creating, sharing and managing project data across project teams and the project CDE. You’ll also learn how BIM 360 Design helps solve challenges of design collaboration and managing dispersed project teams. Finally, we’ll explain how BIM 360 Glue helps solve challenges of coordinating multi-discipline project models across project teams. Optional evening networking event to be held at Digbeth Dining Club from 6pm onwards for dinner and drinks. What is the cost of offsite manufactured solutions for residential – is it cost effective & are clients ready to use more offsite to increase capacity? This is a key Residential Hub event that you shouldn’t miss especially if your interest in offsite housing extends to how much will it cost. This is our first national event and we will be looking closely at the cost of both high and low rise housing; including how affordable they are when compared to different housing tenures and delivery solutions. This residential hub event will look at how the offsite sector is addressing cost, are clients getting value for money and what capacity is there in the sector to deliver a predictable housing supply to market that gives confidence to clients. The panel session will include representatives from the speaker sessions together with key players in the sector who have been instrumental in shaping its direction. The panel (together with the audience) will consider the impact of both volume and quality on the costs and what steps need to be taken to ensure offsite solutions are prioritised. The construction industry is the second largest user of plastic, with 20% of plastic waste coming from the construction sector. It is estimated we produce globally 300MT of plastic annually with 50% of this being single use. Piping and conduit are the largest users of polymers in construction and consume 35% of production. ASBP is not advocating a ‘plastic-free’ built environment. We are a material agnostic organisation who champions optimum outcomes for sustainability. However, we do advocate an approach that wherever possible the use of plastic products in construction should be confined to specialist high value, low volume application areas such as binders, seals, tapes, gaskets and services. 11:15: Hertfordshire Building Control: Compliance process for offsite schemes. ‘Fast Track Approval for Fast Track Construction’ including reference to the supply chain and BOPAS as part of that process. 11:30: Mitsubishi Electric: Call to other members to open up discussions on early delivery and design of M&E with reference to supply chain and impact on whole life costs. 11:45: Lucideon: The benefit of product testing on the supply chain and predictability of offsite housing supply. 12:00: JCB: How a well-established company is bringing a new perspective to offsite; including reference to the supply chain and whole life costs of approach. 12:15: WAGO: With a focus on collaboration with other members including Mitsubishi and how the supply chain is a key factor including how they have developed new working relationships. 13:30: Ideal Lifts: To challenge traditional thinking and disrupt the processes and complexities of conventional bespoke lift shaft construction on offsite projects. How ongoing collaboration with other members can simplify and improve the design, processes, management and safety of lift design, installation and maintenance. How the supply chain can work together to make life easier for others. 13:45 – Soap Box session for New Members – Forum to introduce and give new members the opportunity to introduce themselves. The event will have a morning commencement and will aim at providing a site visit at Anglian Water prior to the session. – “Capability” – What makes a supply partner capable? Registration for Buildoffsite Programme: Day 1 and Day 2. The Offsite Construction Show is being held at ExCeL London on Tuesday 20 and Wednesday 21 November. Nationwide Windows and Doors, Hants County Council, C-Probe Systems, Carnehill Contracting, Wago, Dutypoint, Ideal Standard, BRE, William Attwell Associates, Ecco Modular, O’Carroll Engineering, IPP MagPly and Emtec Products. This is a specialist event dedicated to the #offsite industry. Attracting high calibre professionals with busy schedules, who can spend a few hours having meaningful discussions or attending one or seminars, workshops or new “in conversation with…” covered across our exclusive two day programme. This year, we have assembled a really good mix of well-known offsite industry movers & shakers to headline our 2 day programme of events alongside an ever-growing selection of new exhibitors. Visit the Buildoffsite stand area in Hall N4 of ExCeL London. After the huge success of the 4 previous events, the Conference has firmly become the industry’s leading forum for thought leadership in UK regeneration and economic development. The 26 speaker Conference will once again address the latest issues in urban & rural regeneration, policy and implementation, highlighting the key successes made in major towns and cities, in areas such as city centre and waterfront redevelopments. As the exhibition & conference finish at the end of the first day on Wednesday 7 November, we move straight into the complimentary 2 hour champagne drinks reception & networking evening, from 5.00pm – 7.00pm, where further opportunities arise to discuss business with hundreds of industry colleagues. Have you defined your organisation’s digital strategy? How reliable is your BIM data and can you control its use? Addressing these issues are key requirements for proper BIM implementation and for the Government’s new Digital Built Britain 2025 strategy. From a client or specifier perspective, you may not wish to specify a particular manufacturer early in the design phase – but you will want to retain control of the specification and ensure it cannot be changed. What is the best way of achieving this? Buildoffsite is partnering with the world’s leading experts in digital content management, BIMobject, to offer an interactive workshop – The Importance of Data to your BIM Strategy. · Consultants – project managers, structural engineers and cost managers. Agenda for the event can be downloaded here. GEO| Design+BIM is an exclusive platform in Europe that highlights and initiates discussions related to the use of geospatial data analytics and BIM in spatial design, construction, operation and maintenance. GEO| Design+BIM is an exclusive platform in Europe that highlights and initiates discussions related to the use of geospatial data analytics and BIM in spatial design, construction, operation and maintenance. The event, combination of two innovative platforms: GeoDesign Summit Europe and GeoBIM Europe, was rebranded in 2017. This year, GEO| Design+BIM will delve further into the integration of geospatial technology and BIM; and other associated industry trends including big data analytics, IoT sensors, drones, virtual reality (VR) and augmented reality (AR), robotics, cloud worksharing, modular/offsite construction, city information modeling, digital twin, etc. Join us at our FREE annual Autodesk Building, Infrastructure & Construction User Conference. This event has been specifically designed for your business and is tailored to help your design team drive best in class efficiencies utilising your existing Autodesk software and to introduce the new generation of design and collaboration tools along the way. A one-stop shop for all your essential legal, technical and valuation guidance. Firmly established as the UK’s leading dilapidations event, The RICS Dilapidations Forum Annual Conference returns in 2018 to provide critical updates for practising building surveyors, valuers and legal experts. Chaired by Paul Spaven of TFT, this event will provide a one-stop shop for all your essential legal, technical and valuation guidance. Bringing together leading industry speakers, it provides you with a unique opportunity for you to understand legal essentials, refresh your practical knowledge and learn about the client perspective. This year’s breakout sessions once again offer delegates the chance to tailor their agenda to best suit their specific areas of interest, with a choice of content focussed on mechanical and electrical installations and dilapidations valuations. Plus enjoy the post-event Drinks Reception where you can network with colleagues and our expert speakers. Join 400+ attendees to receive the very latest updates and ensure you remain at the forefront of this complex area of practice. Considering the legal and surveying perspectives, Nicholas Taggart (Landmark Chambers) and Richard Kay (Beckett and Kay Chartered Surveyors) will focus on consequential claims for loss of rent, including practical valuation problems in assessing loss of rent claims, the legal basis for claiming loss of rent, analysis of section 18, and marketing periods, incentives and the operative cause of the loss. Dr David Arnold (Troup Bywaters and Anders) will deliver the mechanical and electrical engineering update, exploring common issues and how they can be best resolved, as well as the reliability of economic lifetables, why M&E dilapidations are different and whether one should repair or replace in the case of a major dilapidated M&E plant. Legal speakeasy: put your questions on contentious matters relating to dilapidations to our panel of expert barristers from Falcon Chambers, including Wayne Clark, Emily Windsor and Anthony Tanney. Schedules of condition: understand some of the most common errors and issues in schedules of condition with Adam Nash (GVA). Minimum Energy Efficiency Standards: combining the technical and legal expertise of Peter Williams (Shoosmiths), Stephen Lemmon and Nicholas Dowding QC (Malcolm Hollis), this session will explore how MEES operate, what works need to be carried out in order to comply with the standards, as well as implications for dilapidations disputes. Conflicts of interest: William Glassey and James Morris (Mayer Brown) will deliver an in-depth session examining the RICS global professional statement on conflicts of interest and it’s practical application. Negotiation for dilapidation professionals: back by popular demand, Nick Davies (The Really Great Training Company) joins us once again to delve into the crucial negotiation skills required to be a successful dilapidations practitioner. Closing keynote: The client perspective. This year’s ‘fireside chat’ will give you invaluable insight into the landlord and tenant perspectives and will explore what your clients require from you in your role as a dilapidations surveyor. Sally Duggleby (Savills) and Stuart Davies (ProLogis) will consider the impact future dilapidation liabilities have on commercial decisions when agreeing new terms, to give you insight into your clients’ decision-making process. Following the success of last year’s Inspire Summit, the one day conference and exhibition returns to Manchester’s Bridgewater Hall on the 25th September. The focus for the 2018 summit is how we attract and retain women in the construction and related industries, with tangible takeaways for industry participants who want to increase their gender diversity. TRACK 1: With the ‘Inspire Industry Change’ conference track, delegates can expect a comprehensive business case for why the industry needs to change and expert presentations on what needs to be done and how we can achieve gender equality in UK construction, engineering & housing. 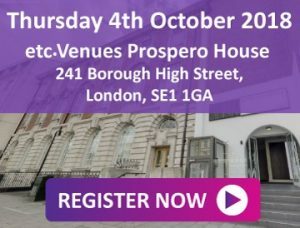 This will comprise a balanced gender mix of speakers and is aimed at attracting professionals of all sexes who are serious about achieving gender parity in their organisation and the wider industry. TRACK 2: As with the 2017 event, the paid professional delegates will subsidise free attendance for students, apprentices and women of all ages who don’t currently work in the sector (but are considering doing so) to attend the ‘Inspire the next generation’ conference track. Presentations will highlight current & future roles in construction, break down stereotypes, hear from inspirational female role models, showcase live projects and offer viable routes into an exciting career in the building industry. There is a long journey ahead to successfully adapt, innovate and increase productivity in the built environment. Digital is starting to catalyse change, as digital platforms enable work to be done differently. This means that behaviour, skills and methods of working need to keep pace. The true value of data and technology as tools need to be unlocked within the industry. This event aims to accelerate this change within the industry by providing global perspectives and access to knowledge from different sectors to drive the digital revolution in civil engineering. The 2018 event will focus on being security minded, alongside the three key themes of productivity, behaviour and value of data. 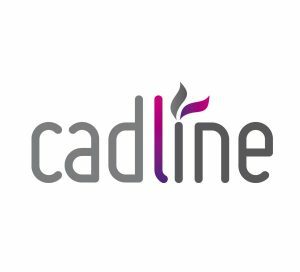 The 2017 event featured speakers from Atkins, Digital Catapult, Microsoft, Topcon, Tube Lines, Mott MacDonald and more. Stephen Crompton, Chief Product Officer at GroupBC will be one of the speakers at the inaugural Introduction to Building Information Modelling (BIM) course presented by the Department of Continuing Education at University of Oxford. BIM is a process of digital representation of physical and functional characteristics of places; and during this first of its kind course, you will be introduced to qualitative BIM application. This course takes place on 22 to 23 September at Rewley House, University of Oxford. Other speakers include Professor Fabio Garzia, Professor of Safety & Security Engineering, University of Rome, Italy who will be discussing Restoration of Vatican’s Papal Basilica Using BIM. Dr Sepi Chakaveh is Senior Associate Tutor (Data Science) at the Oxford University Department for Continuing Education. She has a degree in Electronic Engineering & a PhD in Experimental Astrophysics & Space Sciences. Sepi has been teaching & researching Dynamic Objects & Data convergence and will be presenting on DATA Science Essentials for BIM. Discussion of Modern Methods of Construction (MMC) needs to be in the context of a shortfall of about 100,000 newbuild housing completions per annum against government targets. Also relevant is the diminishing residential construction labour force due to age, repatriation, and lack of replacement, as spelled out in Mark Farmer’s report, “Modernise or Die” in 2016, and the flight of SMEs from the sector. Without a very significant volume adoption of MMC, the lost decades of housebuilding will not be clawed back. This event launches the RICS Modern Methods of Construction Case Studies Paper on new homes constructed utilising various MMCs. The paper aims to raise consciousness and confidence about MMC and is aimed at all those who are interested in solving our housing crisis, including designers, surveyors, lenders, investors, developers, constructors, central and local government, housing associations and perhaps most importantly, customers. The case studies are accredited under the Build Offsite Property Assurance Scheme, which was launched in 2013 by RICS, Buildoffsite, Lloyds Register, Building Life Plans and sets a standard for homes built from non-traditional methods and materials to stand the test of time for at least 60 years. Attend this event to hear from an expert panel on these issues as well as gain an insight into the case studies. The keynote speech will be delivered by Mark Farmer, chair of the MHCLG’s MMC Working Group. You will also get the opportunity to engage with fellow surveying professionals, lenders, investors, funders, designers, developers, constructors, and representatives of central and local government and housing associations. This launch event will address the key fire safety considerations, building regulations, identify best practice and provide expert knowledge to best advise your clients. The tragedies of major fire incidents in recent years have cast a spotlight on fire safety standards, building regulations and risk management. Numerous inquiries have found a need for significant improvements and called for professionals operating within the built environment to take accountability for their role in driving fire safety standards within the sector. This is leading towards a major cultural shift, with consideration of fire safety at every stage of a building’s life cycle essential to ensuring improved outcomes for the industry as a whole. Understanding the core elements are crucial, from design and engineering, to maintaining fire safety during occupation and ensuring ongoing compliance. RICS Fire Safety Conference brings together leading experts in the field to address the key considerations, identify best practice and adopt strategies to ensure they are adhering to the highest standards. Join us September 13 at either 11:30am BST or 2:00pm BST to watch our webinar showcasing our BIM software solution MWF (or Metal Wood Framer) in action within the Revit(r) environment. StrucSoft Solutions is a developer of BIM software components targeting the AEC and manufacturing sectors. Our star solution MWF, is our automated Revit(r) wall, floor, ceiling and truss framing software for wood and light gauge steel modeling. MWF simplifies complex Revit(r) framing with its powerful range of tools for modeling, inter-trade clash detection, custom construction documentation and optional output to CNC machines. This month’s webinar will be covering modelling and manufacturing directly within Revit(r). Our technicians will walk you through the creation of walls, how to create shop drawings, CNC output as well as how to optimize floor and wall panel stacking and shipping using MWF Panel Stacker. Please note that a recording of the session will be send to all registrants after the webinar. Join leading experts to learn how technology can enhance your practice, save you and your business time and money and provide a better service to your clients. “The time is ripe, even overdue, to take a cold, hard look at what a highly disruptive technology could do to the industry.” RICS Artificial intelligence: What it means for the built environment. Technology has the power to dramatically reshape the way we work and the built environment around us. It is therefore vital that the surveying profession embrace these new innovations which have the potential to provide solutions and achieve efficiencies in your day to day practice. The inaugural RICS Digital Built Environment Conference will assemble the leading experts in the PropTech arena to highlight and showcase how technology can enhance your practice, save you and your business time and money and provide a better service to your clients. Attend this event and benefit from an exhibition area where you can have hands on interaction with the technologies to see how they work and the benefits they have to offer. Attend this event and benefit from an exhibition area where you can have hands on interaction with the technologies to see how they work in practice. Book before 1 May to benefit from the Early Bird discount. Like most large asset owners, Sainsbury’s need to answer questions easily about their estate every day. This is why the one of the UK’s largest retailers has been working with GroupBC to create a ‘Digital Estate’ – a globally accessible, secure web portal, to manage, update and query spatially-located asset information, supporting those making decisions during the asset lifecycle. That this digital estate is created, not from 3D models but from existing 2D drawings, is what makes this BIM solution truly inspiring. Our guest speaker Michael Barber, System Development Manager for Sainsbury’s, will discuss the challenges Sainsbury’s faced as the retail environment has changed over the past few years, and how they needed to ‘sweat their assets’ as the focus moved from new build. Suitable for Innovation Directors, Information Managers, Business leaders, business Improvement Directors, Project and Estate managers/directors looking to improve business process efficiencies, project collaboration, accelerate project delivery, optimise asset utilisation and mitigate the risks of loss of information whether in the retail, property, utilities, infrastructure, government, public or private sectors. Michael is the System Development Manager for Sainsbury’s, managing their ‘Digital Estate’ programme by taking the principle of BIM to give the business the ability to answer plan language questions e.g. What have we got?, How big are our assets? Are they being effectively used? Michael is currently the leading driver of Sainsbury’s ‘Digital Estate’ programme on behalf of the property division. 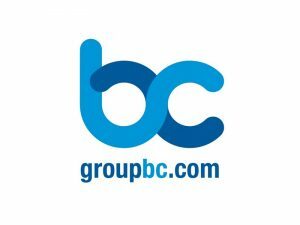 Stephen Crompton is the CTO of GroupBC who began his career as a mathematical modeller for an environmental consultancy where he became involved in the development of the information management and collaboration solution that became BC. With nearly twenty years of experience in construction information management, Stephen is now focussed on ensuring that open, linkable data is at the heart of BIM. thinkBIM, in conjunction with event sponsors GroupBC, are pleased to bring you the summer conference on the theme of data management in the context of the work of the Environment Agency. Karen Alford, BIM/GSL Programme Executive at Environment Agency. As an asset owner the agency has spent time documenting and structuring standards, data and document requirements. Karen will be returning to give delegates an insight into the their digital journey and next steps. Trevor Mossop, Technical Services Manager, JT Mackley & Co. Ltd. Trevor will be presenting on their businesses experience in Connecting Data and looking at how BIM on coastal and flood defence projects can be linked to Geographical Information Systems via their CDE to provide easily accessible asset information. thinkBIM is the award winning and original network set up in 2011 by Leeds Beckett University to enable sector wide adoption of BIM (Building Information Modelling). They run regular monthly seminars, workshops, technology showcases and conferences designed to bring together early adopters and leading practitioners in the field to share knowledge and expertise for the benefit of all. Project information management and document control is easy, right? Since the late 1990’s and the advent of the world wide web, the opportunities presented to construction to revolutionise project delivery through technology adoption have been significant. Fast forward to the present day and we see UK Construction going through its own digital transformation, with many organisations embracing change by reinvigorating and systemising processes and upskilling their people. But practically, how far have we progressed over the last 20 years in the way we manage projects? Join this webinar on the 24th May at 10:00 for 1 hour, to hear Stephen Crompton, CTO at GroupBC discuss the practicalities of traditional project delivery through to the heavier weight document control demands of BIM and level 2 compliance. From WIP design to drawing issue – streamlining the workflows for verified, assured and approved information flow across your project team and to your client. The fundamentals of information management and more formal document control have not changed, however technology to support you has! Find out more during this webinar. This event will showcase the potential of an innovative regenerative system that will change the way construction and building services currently operates with regards to refurbishments, new build and maintenance of buildings. Use this link for more information and please note the code ECA100 to book your Free place. Organisations can no longer ignore the impact BIM is having on our industry – but with 84% of companies failing to achieve real business benefits from their digital transformation programmes (Forbes, 2017), transforming the way you do business is clearly not an easy task. Whether you’re an asset owner, construction client or provider of goods or services, any organisation embarking on a digital transformation programme – either because they want to, need to, or have to (and in many cases it’s all three) – must have effective leadership in place and a shared understanding across all levels of the business of the need for change if they are to have any chance of achieving sustained success. Join Paul Shillcock on the 16 May from 10:00 — 11:00 am, to be informed and entertained on the drivers, benefits and challenges of digital transformation from an industry and organisational perspective. You will gain practical insights from Paul’s experience of supporting organisations around the world to take a progressive and phased approach to developing the capability and capacity they need to achieve sustained success. If you have been tasked with, or are responsible for, driving business transformation within a team, business unit or organisation and are currently trudging through the plethora of national and industry standards which define BIM, desperately trying to work out where to start, then this webinar is aimed at you. This webinar is part of the Information Management for Clients, Contractors & Consultants series. Paul specialises in the development and implementation of business processes that enable organisations and teams to adopt a collaborative approach to the use, exchange and production of information – often referred to as Building Information Modelling (BIM). The RICS Quantity Surveying & Construction Conference returns in 2018 to review how the sector is performing, analyse current demands on the industry and its future direction. While the growth of the construction sector remains positive, the skills shortage and Brexit continues to dominate the industry and cause uncertainty. Hear first-hand views from our expert speakers – CEOs, economists, developers, contractors and more, to discover how to solve and tackle these issues. The event will be a mixture of high-level strategic debate combined with practical sessions that will positively impact your day-to-day practice. Dedicated technical sessions will examine building contracts, whole life costing and case law updates. The day will culminate in a debate tying together the conference topics to understand the strategies and new methods of construction needed to respond to today’s, tomorrow’s and the future requirements of the industry. This is the must attend event for anyone wanting to be at the forefront of the construction sector. Don’t miss the Early Bird discount – book before 21 February to benefit. FREE annual Autodesk Building, Infrastructure & Construction User Conferences. These events have been specifically designed for your business and are tailored to help your design team drive best in class efficiencies utilising your existing Autodesk software and to introduce the new generation of design and collaboration tools along the way. Join us for Bluebeam Extreme Conference Europe 2018, taking place from 18-19 April in London and be the first to get in-person training on our new software release, Bluebeam® Revu® 2018. Discover how companies are leveraging Bluebeam solutions, hear from thought leaders on industry trends and network with like-minded professionals from architecture, engineering and construction firms across Europe. Check out the top reasons to attend and secure your spot before space runs out! Learn how to get more out of Revu to increase project efficiency and collaboration by choosing from over 30 sessions including lectures with valuable tips and tricks and exclusive access to hands-on training with the all-new Revu 2018. Collaborate with and learn from fellow experts from Skanska, NCC, Forcia and Hilson Moran. Share best practices, improve processes and create standards. There is no better way to expand your network than by mixing and mingling with industry peers like Fred Mills from The B1M. Participate in a broader dialogue around the challenges and opportunities facing the design and construction industry through roundtable discussions. Ask questions, relay your best product ideas and make friends with some of the people who build your favourite software solutions including Bluebeam, ALLPLAN and Graphisoft. This category is designed to recognise the implementation of a campaign that has led to significant improvements to any of health, safety, fire safety or security to persons or premises. The implementation of this campaign must not have taken place any earlier than 1 June 2016 and any campaign launched prior to this date are not eligible for entry. The individual must also have a role wherein at least 50% of all tasks undertaken are focused directly at the host organisation’s core health, safety and wellbeing functions. They must also have made a significant contribution to the introduction and promotion of standards within the health, safety or wellbeing since 1 June 2016. Any person accomplishments prior to this date are not relevant and will not be eligible for entry. This category is designed to recognise an individual who made a significant contribution to the implementation or enhancement of health, safety or wellbeing standards within either their own or a client organisation. They must also have made a significant contribution to the introduction and promotion of standards within the health, safety or wellbeing and not been in post prior to 1 January 2016. Any person who has been in post prior to this date are not eligible for entry. This category is designed to recognise products or solutions that have been developed for either active or passive fire protection. The installation of these products must have taken place since 1 June 2016 and the products must have been launched no earlier than 1 June 2016. Any products or services launched prior to this date are not eligible for entry. This category is designed to recognise health and safety teams that are making a significant difference in their workplace. The submission should demonstrate how the activities and initiatives implemented by the team since 1 January 2016 have helped to improve the health, safety or wellbeing standards and performance within either their own or a client organisation. Any accomplishments achieved prior to this date will not be eligible for entry. This category is designed to recognise products or solutions that have been developed to improve security standards (this can include perimeter, CCTV, alarms, guarding, anti-terrorism, cyber or exterior deterrent). The installation of these products must have taken place since 1 June 2016 and the products must have been launched no earlier than 1 June 2016. Any products or services launched prior to this date are not eligible for entry. Based upon case studies submitted by members, these awards recognise major improvements in occupational safety created in 2016/2017. Quality and accessibility are essential which is why the event is FREE to attend and the vendors you will meet are among the most respected currently operating in the UK. We understand the need shared by safety professionals and employers for straightforward and reliable advice. Our Safety Dialogue Theatre offers you a unique opportunity to ‘Join the Debate’ and contribute directly to discussing the topic of the day. Use this chance to share your experience with your peers and network with a panel of recognised authorities on each topic. Safety Dialogue is a collaboration between the British Occupational Hygiene Society (BOHS), nebosh, AIF, NASC, ISRP, BSIF, The Energy Institute, our title sponsor 3M and our additional sponsor IOSH. The Safer Logistics Seminar and Feature area is building on last year’s exciting debut with a better than ever line-up of partners to provide first class presentations tackling key safety hot spots in the world of warehousing and logistics. Safer Logistics brings together expert guidance and advice from leading industry bodies including the Fork Lift Truck Association (FLTA), Chartered Institute of Logistics and Transport (CILT) and RTITB (formerly the Road Transport Industry Training Board). Supported by NEBOSH, this feature will provide direct access to advice and guidance as well as market leading vendors for those seeking to improve standards of training and education in their work place. Whether you are seeking a enhance your career, make a move in to health & safety or simply needing to improve knowledge and understanding among your workforce this feature is for you. The Safety and Health Excellence Awards will celebrate innovation and achievements in the heath, safety, security and fire sectors. The ceremony will encompass the long-established British Safety Industry Federation (BSIF) Awards that promote the importance of innovation and underline the highest standards of excellence within occupational safety and health. The awards will be held at the prestigious VOX Conference Centre on 11 April 2018 at the NEC, Birmingham. With more than 250 leading safety, health, fire and security brands on site for the Health and Safety Event and Fire Safety Event, this is the ideal opportunity for the industry to gather to celebrate excellence. Combined with The Health & Safety Event and Fire Safety Event, the three shows provide the ultimate opportunity for FM’s to keep educated and informed with professional content, inspirational case studies and hands-on advice from exhibiting companies. We know just how valuable your time is and are therefore committed to the continuous improvement of the educational content we provide. Our range of conference and seminar topics is designed to inspire you to be heard and affect real workplace enhancement. Delivered by engaging and thought provoking individual speakers as well as carefully created expert panels, we provide the chance to exceed your CPD requirements without any delegate fees. Designed to empower and inspire, the FM Matters theatres will deliver three keynote sessions per day, from leading FM speakers and industry influencers. Be part of the conversation and engage in our three daily panel debates lead by a panel of senior FM experienced professionals. In 2018,The Facilities Event will deliver its strongest, most practical training and education offering, as leading international specialists demonstrate how the profession can boost the bottom line as a strong strategic partner to UK Plc. With a mission to challenge, change and collaborate, experts from Dell Technologies, Land Securities, Workplace Fabric and Birmingham School of Engineering and the Built Environment, will tackle the macro issues affecting the sector through keynote sessions and interactive panel debates. The entire programme will explore how FM can help to solve the UK’s ‘productivity puzzle’ through increased employee engagement, health and wellness. Held from the 10th – 12th April 2018 at the NEC, Birmingham, the event features a powerful combination of education, networking and business support designed to help organisations maintain the very highest standards of fire safety management. No venue can compete with Birmingham’s NEC for accessibility. Situated at the heart of our transport networks no venue is better connected, which is why the NEC is the obvious choice when we host the fire safety community together in April. Carefully curated and delivered in partnership with the Fire & Security Matters magazine, The Fire Safety Event 2018 free seminar programme will cover and challenge critical topics in fire safety management today. Across two theatres, content will feature a mix of case study presentations, white paper presentations, thought-provoking debates and legal updates all presented by government officials, lawyers, and leading industry professionals. By attending you will be able to see and experience the very latest products and services on the market today. With over 30 specific fire safety companies exhibiting at the event, you will be able to discuss your organisation’s fire safety needs 1-on-1 and receive practical hands-on information and advice from major fire safety brands in the industry. Daunted by GDPR? This seminar has been developed to provide organisations with information to enable them to become GDPR compliant by May 2018 deadline. This joint venture between Lloyd’s Register and Secarma will provide a roadmap to GDPR compliance, with a specific focus on data, technology and cybersecurity. This full day event has been designed for valuers within the Commercial Property, Machinery and Business Assets, Business Valuation, Trade Related Property, Business Valuation and Arts & Antiques Professional Groups. Valuation 2018 will feature five streams for each group and will tackle topics that are most relevant to you and your professional development. Join us as we start off the day with a series of plenary talks such as the global market conditions and predictions and risks and liability in valuation works. Stay up to date with the latest changes to the Red Book and join a panel discussion where we will be exploring the rise of artificial intelligence, valuation technology and what these all mean for the valuer. Network with industry colleagues at lunch before breaking out into sessions that are relevant to your profession. A breakfast briefing for Product Manufacturers interested in becoming DataBook early adopters. DataBook is a web service application provided by BRE which allows manufacturers to host their product data for FREE in agreed industry formats. Users of the data – such as Architects, Engineers, Contractors and Operators – will be able to freely access and link the data to their BIM objects using a selection of technologies. This BRE breakfast session is intended for manufacturers who wish to get involved as DataBook early adopters. It provides an opportunity to view the technology solution; discuss how you can get involved and provide feedback on the process; review what you need to do to provide your product data in appropriate formats and understand the benefits this can provide to you and your client base. Please note places are limited, so please contact Sue Waddington who will be in touch to confirm your reservation. Why DataBook? Solving the problem. Those involved in BIM within Product Manufacturing companies. 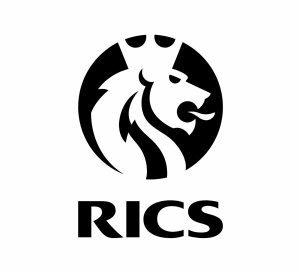 Aimed at those in the construction sector the RICS Dispute Resolution in Construction Conference will provide practical strategies in choosing the best form of ADR to help your clients avoid disputes altogether or resolve them as efficiently as possible. Join us to hear a roundup of the latest case law to ensure you translate the outcomes and learnings from these into your everyday practice. During the day we will also examine how to challenge third party decisions, navigate international disputes and delay and disruption claims. Aimed at those in the construction sector, this one-day conference will provide practical strategies in choosing the best form of ADR to help your clients avoid disputes altogether or resolve them as efficiently as possible. Join us to hear a roundup of the latest case law to ensure you translate the outcomes and learnings from these into your everyday practice. During the day we will also examine how to challenge third party decisions, navigate international disputes and delay and disruption claims. Network with your colleagues and gain useful tips, strategies and dispute resolution mechanisms which can be applied in your own business practices. View the agenda to see the full programme and sessions throughout the day including ADR, conflict avoidance, adjudication, 3am clauses and much more. This is a 1 day seminar on the use of video for marketing within the building and construction sector. Are you aware of the importance search engines place on embedded video? Are you getting lost in the different technologies and legislation surrounding the use of video in the UK? If so, then this seminar is just for you. The seminar will cover every aspect of a video based marketing campaign from choosing the right camera, editing and using the best social media platform to current rules and regulations on camera and drone use. Speakers from the UK’s leading providers of video products, social media, and drone cameras will share their knowledge on each topic combined with advice and guidelines on current legislation and marketing trends throughout this exciting seminar. Smart infrastructure is becoming a reality and each asset will soon effectively “think for itself”. To prepare transport and construction professionals for this new reality, the Institution of Civil Engineers is gathering the UK’s leading project teams already using the latest technology to understand how to optimise maintenance decision making, gain efficiencies and reduce waste. The one-day conference programme features thought-provoking, strategy-setting sessions from the Department for Transport, Highways England, Network Rail, HS2, UK Roads Liaison Group, Rolls-Royce and many more. View the agenda at ice-tam.com. Join our unparalleled speaker line-up at ICE TAM 2017 to stay ahead of the trends, explore new ways to approach critical challenges and future-proof your organisation and career. 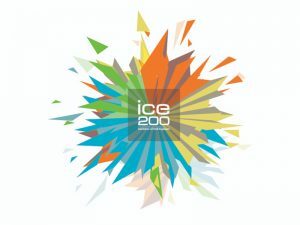 Secure your place online at ice-tam.com and quote PBC10M to take advantage of the special 10% discount. The annual RICS Building Surveying Conference in Scotland returns to keep you up-to-date with the latest technical information, legal guidance and economic forecasts. A key theme of this year’s event is examining the trends that will impact the sector and the challenges and opportunities they will present, including modern methods of construction and technology. Attending this conference gives you the opportunity to benefit from the knowledge of our expert speakers, ensuring you remain at the forefront of your profession and are equipped to provide the best advice to your clients in common areas of practice. Hear the latest economic updates from Gordon Nelson, Director, Federation of Master Builders. Listen to an inspirational keynote from an industry leader about how they utilised disruptive technology. Benefit from need to know sessions on recent case law and legal updates. Hear a round-up that will cover the essential issues for surveyors, including professional negligence, repairs and dilapidations by Alan McMillan, Partner, Burness Paull LLP whilst Sandra Cassels, Partner, BTO Solutions will lead a session on the changes to NEC4 and JCT construction contracts and the proposed timelines. Choose from breakout sessions to allow you to choose and create your own agenda for the day to ensure you take away practical guidance that is tailored to your business development needs. 16nov8:30 am5:00 pmRICS Building Surveying Conference, ScotlandThe Latest Technical Information, Legal Guidance and Economic Forecasts. FREE annual Autodesk Building, Infrastructure & Construction User Conferences. These events have been specifically designed for your business and are tailored to help your design team drive best in class efficiencies utilising your existing Autodesk software and to introduce the new generation of design and collaboration tools along the way. The RICS Legal Issues in Construction Conference is an essential update for all practitioners working within the construction sector. Providing crucial updates on the most recent case law, practice and procedures – this year’s programme has been developed in partnership with Pinsent Masons and Keating Chambers, the leading Law Firm and Chambers operating in this area. Don’t miss your opportunity to hear the latest developments and legal insights to help you to effectively manage risk in your organisation and remain compliant. case law relating to limitation periods. Benefit from a panel of expert speakers offering leading legal advice on a range of contentious issues with the potential to directly impact you and your business practices. Take away practical knowledge and tools that you can immediately apply to your work. You will also gain 5.5 hours of formal CPD for attending.